How curious it is that three of the finer releases in an especially weak pack of new holiday recordings belong to jazz pianists whose take on yuletide sounds could not be more varied? Pianist Harry Connick Jr.’s Music From The Happy Elf may be the most unexpected of the three. A veteran of several Christmas-themed recordings that showcase his big band and traditional (as well as overtly commercial) pop preferences, Elf presents the pianist in one of his most inviting and overlooked settings: the piano trio. It’s hard not to smile at the percussive cracks of drummer Arthur Larkin and Connick’s sparse piano mischief during Naughty Children of Bluesville (which sounds like O Tannenbaum trying to escape from a blues cellar) or the way the light, lullaby turns of Christmas Day melt into the intimate swing of What a Night. It’s a Christmas miracle: Holiday music that’s actually worth hearing. Read the rest of Downbeat’s picks for holiday music here. NEW ORLEANS — There was a standing room only crowd, with actress Renee Zellweger in the audience, for the dedication of the new Ellis Marsalis Center for Music, the centerpiece of Habitat for Humanity’s Musicians Village project in the Ninth Ward. Harry Connick Jr. and Branford Marsalis played key roles in developing the Musicians Village, and the center, but as performers, they called this hall acoustically perfect. “You could bring a string quartet in here, and they could play without one shred of amplification, and everybody in here could hear every note in here regardless of the volume,” raved Marsalis. Two days before Thursday’s official unveiling of the Ellis Marsalis Center for Music, I asked Harry Connick Jr., a driving force behind its creation, if he felt like an expectant father. His point was, it takes a village to raise a Village. The new,multimillion-dollar arts education center in the Musicians’ Village has many fathers. Among them were Connick’s close friend, saxophonist Branford Marsalis, and the duo’s longtime manager, Ann Marie Wilkins. She, Connick made clear, handled most of the grunt work — the paperwork, the endless meetings, the logistics, the sweet-talking, the arm-twisting. New Orleans Area Habitat for Humanity, under executive director Jim Pate, developed the Musicians’ Village from an idea Marsalis and Connick hatched while driving to Houston soon after Hurricane Katrina to entertain evacuees. On Wednesday afternoon, Harry Connick Jr. and Branford Marsalis kicked the proverbial tires at the Ellis Marsalis Center for Music, the new, multimillion-dollar arts, educational and community center in the upper 9th Ward’s Musicians’ Village. They jokingly checked under classroom desks for gum. They strode the dance studio’s wood floor. They demonstrated the 1.5-millisecond echo in the 150-capacity, acoustically engineered performance hall. 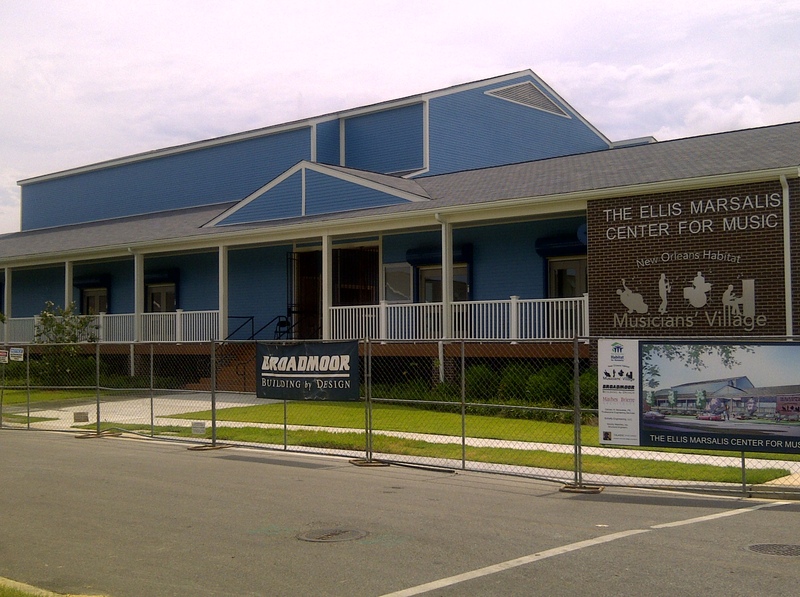 The Ellis Marsalis Center for Music, named for Branford’s father, the storied jazz pianist and educator, officially opens today with a private celebration. Gov. Bobby Jindal and Mayor Mitch Landrieu are expected to speak. Connick, the senior Marsalis, and Branford and several of his siblings are slated to perform.